More than 10.000 retail, fintech and commerce professionals come during Seamless Dubai to discuss the future of these industries. 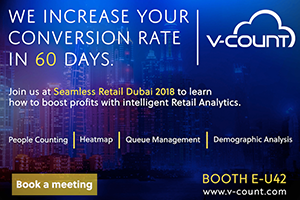 We are exhibiting for the first time in Seamless Dubai Retail this year and would be happy to meet you at our booth #E-U42 to tell you more about V-Count’s solutions and latest features in Retail Analytics. On April 15th-16th, stop by our booth to learn more about Demographic Analysis, Queue Management, MultiCamera Heatmap, People Counting, Staff Exclusion solutions and Business Intelligence Platform.